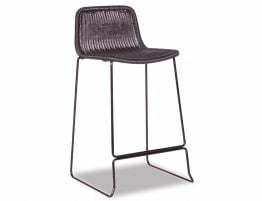 Time to funk up your kitchen with The Willow Kitchen Bar Stool. 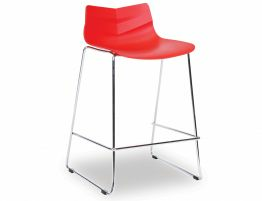 It is a latest design of the mod fashionable kitchen stool design that's current in the design industry today. 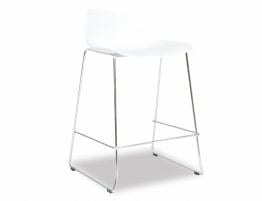 Made with a poly plastic conformed seat with grove detailing adding texture with architectural appeal. 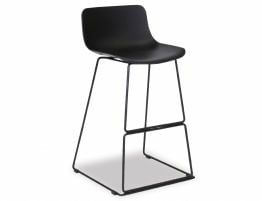 The Willow Kitchen Stool is an inexpensive designer option suitable for any updated interior. The mid back rest section allows for a supportive and comfortable fit without the stool scaling above the kitchen bench height and impeding on a sleek and slim lined look across the counter. The modern Willow Kitchen Bar Stool is a stunning feature stool that is not just mod contemporary but of an architectural nature too. The Poly Seat is a most popular and sustainable material and used world wide today, and the steel frames contrasting works wonderfully.